Crystals have gained a lot of momentum and popularity recently. Not only are they beautiful both physically and figuratively (think about how long it took for the earth to make them into what they are! ), but they also have fantastic affects on our energy. So, how do crystals work? Essentially, crystals help to ground us to the earth. Constructed with the help of the Sun, Moon, and oceans, these millenia-old rocks produce powerful vibrations that let out energy that can be harnessed for healing, positivity, and setting intentions. 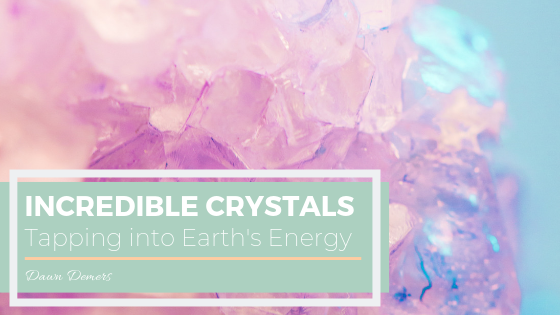 Before skepticism sets in, there is scientific evidence that works to back up the power of crystals. Consider this: crystal quartz, a popular crystal, can be dated back to the creation of our planet. It currently makes up 12% of the Earth’s crust and can be found in a significant amount of modern technology, like watches and clocks, electronics, and data storage mechanisms. These crystals help to power such machines—so why shouldn’t they help power us? Scientifically, Marcel Vogel, an IBM scientist, noticed that crystal quartz changed shape and form constantly through vibrations, which is caused by a continuous assembly and disassembly of the molecules that make up the crystal. He believed that these rocks have the ability to store thoughts in the same way that data chips do. Therefore, crystals are thought to be able to hold our intentions. In turn, they serve as a reminder and a grounding source for us to hold onto when we work to accomplish our goals. The first of the seven chakras, the root chakra is most heavily associated with the color red, making a deep red garnet a great stone to help clear out and heal negativity. Healing chakra can be an intense experience. Deepak Chopra warns that when meditating you may see red spots of color during the healing process, but this is just a sign that the process is working. Also referred to as the naval chakra, this region of your body can easily become inundated with positive ions that prohibit communication between your body and mind. Feeling unbalanced and confused can often be attributed to a clogged sacral chakra. A blockage here can also lead to issues with sexuality and sensuality. To clear out those positive ions and regain your balance, try meditating with orange carnelian. This lovely, golden-orange crystal is a stone in the third chakra, the epicenter for energetic power in the body. Citrine is said to help women move into leadership positions and make powerful decisions in business. Many crystal experts also purport that citrine is incredible for boosting self-assuredness and confidence. You should reach for this stone if you’re feeling a little lacking in the self-love department or if you think you haven’t been loving others as freely as usual. Rose quartz, a soft pink crystal, works to enhance self-esteem, boost your confidence, balance emotions, and release all the negative emotions holding you back. It has a deep association with the heart chakra, the region of our being that allows us to give and feel love. Royal blue, aquamarine, and flecks of gold make up this incredibly beautiful crystal. Known to aid in the ability to be yourself, this fifth chakra stone will allow you to speak fluidly with grace and confidence. Crystal experts suggest holding this stone in your hand while public speaking or during a moment where you find it difficult to gather your words. The stone will absorb any anxiety you admit while releasing powerful and positive vibrations. As its name suggests, the sixth chakra aids in our imagination, wisdom, intuition, and our ability to see the bigger picture. If you find yourself focus on the nitty gritty aspects instead of your overall goals, meditating with a third eye chakra crystal, like Kyanite, can help to calm your spirit and think logically. This stone is associated with the seventh chakra, the crown chakra which is located at the top of the head. Thought of as the best crystal for advanced healing, clear quartz boosts energy, clear thoughts, and the vibrations of nearby crystals. Experts suggest that this is the best crystal to use for setting intentions and getting you in tune with your true-self and spirit guides. While crystal healing has its critics, many are finding that adding crystals to their self-care routine enhances their mindfulness and increases their happiness and positivity. If you can become more grounded—one with the Earth—why not give it a try? Dawn Demers is a freelance writer, life coach, and a creator of 360 Way of Life, an online community for women over 50. As a onetime employee in a Fortune 500 company, Dawn has years of interpersonal, leadership, and business experience under her belt. In 1998, after nine years in the corporate world, Dawn discovered a new passion and purpose to pursue. After discovering that her daughter would need lifetime care and guidance, Dawn began working as an advocate for children with special needs and their families. She formed Oxford Hills Parent Awareness, a non-profit organization that provided support to families and persons with disabilities through various programs and services. As the years progressed, Dawn began to find herself spending an increasing amount of time helping other people through obstacles and hardship. Now, Dawn has carved out a niche for her business: helping older women navigate change and all the wonders that life has to offer.